When I walked through the gully in 2013 with my good friends Simon and Lynn it was quickly evident that there had been severe storms and heavy rainfall in the preceding months. Erosion and collapsed areas were common-place. 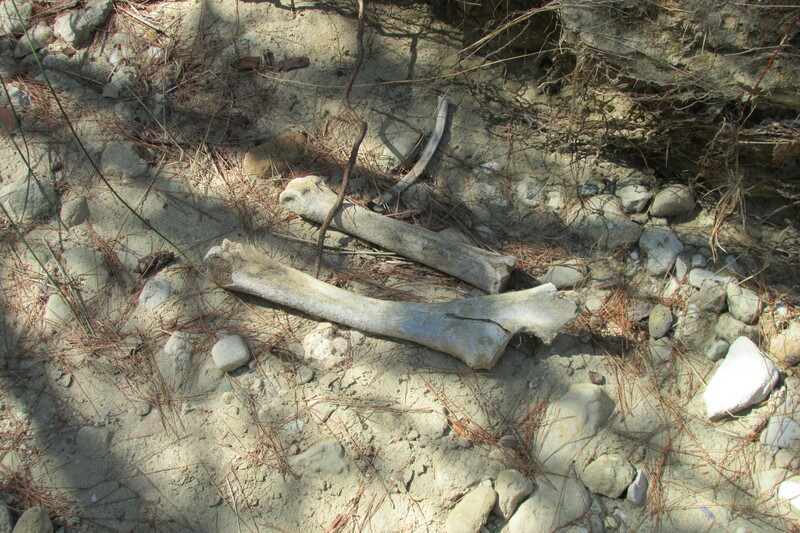 Some 300 metres north of Aberdeen Gully, in the vicinity of Gully Farm, we came across the washed-out bones of a human being, apparently a humerus, a tibia and perhaps a rib bone. The bones did not constitute a ‘burial’ as such, so although I reported the sad find to the CWGC in Canakkale it is highly unlikely that any action will be taken. Amongst the names given to Gully Ravine by the soldiers who lived, fought and died here, it is perhaps inevitable that one was ‘The Valley of Death’. (Psalm 23.4). The numbers of dead in the gully was in the tens of thousands, allied and Ottoman, so it is not too surprising that bones will come to light on occasions. We cannot now identify them individually, but we can honour them still, of all nations. If you do find the remains of one of the fallen, please report it.